Here’s a quick and easy recipe – hey, it has two, count ’em, two main ingredients – for cauliflower that you’ll lap up quicker than you can say cruciferous vegetable and plead for seconds. Even if you don’t like cauliflower. It’s a smooth, creamy sauce made of cauliflower and garlic. Lots of garlic. A pinch of salt and pepper complete this recipe, which makes a succulent, smooth sauce that you can use with veggies, casseroles, rice, as a sauce for pasta – the possibilities are limitless, including eating it out of the storage container with a spoon because it is That Good. I’m thinking it would make a delightful sauce over eggs as well. Full disclosure: I like to add a third ingredient to this sauce, because. Ingredients. That ingredient is half and half. For each head of cauliflower, I add about 1/4 C. of half and half, I find it completes the smoothing process beautifully. It is entirely optional, if you want a totally vegan sauce, simply substitute more olive oil for the butter half in the recipe and omit the cream – it will still be as delicious! 1 medium head cauliflower, trimmed down to small florets. You will use the entire white part of the head – no need to use the stem or any of the green leaves, as you snap the florets apart, you can either discard them or reserve them for your stock container. 8-10 good cloves of garlic. If you have tiny cloves, use more. Minced and smash with the flat of a kitchen knife or cleaver. 1 to 1-1/2 tsp. salt. I used 1-1/2, I recommend using 1 tsp. as a starting point until you’ve determined your own preference. 1 T. salt for the water you boil the cauliflower in. In a large saucepan, boil enough water plus one T. salt to very comfortably fit all the snapped / trimmed cauliflower florets. Have at the ready a spider or strainer. Add the cauliflower florets and boil until they’re soft – not mushy, but if you took one out and pinched it between your fingers (Careful! They’re hot!) it would smoosh a bit. In a second, medium sized saucepan, heat the oil and butter (or just oil for vegan), add the garlic and salt and cook over medium until the garlic becomes soft and very fragrant – this should take about 3-4 minutes. 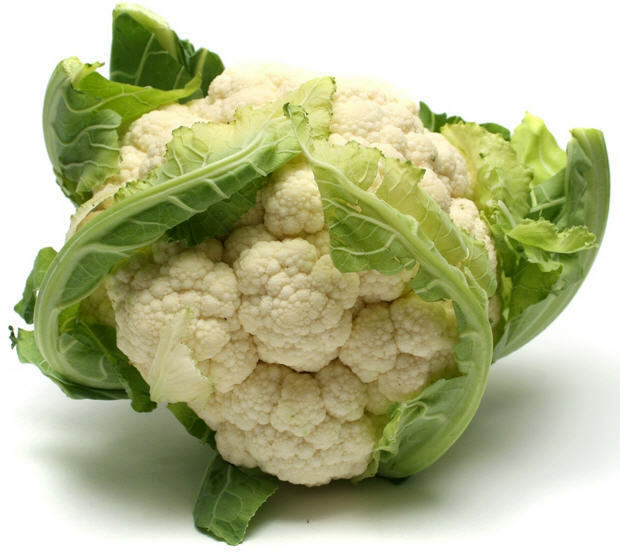 When the cauliflower is soft, use a spider or strainer to transfer it to a food processor or blender. Use a spatula to scrape all the garlic / oil bits into the food processor. Add 1 C. water from the pot you used to boil the cauliflower. Then blend until it’s smooth. In an average food processor, this might take about 90 seconds or so. If your processor is of a more potent variety, then it will take a minute – or less! At the end of the blending, add 1/4 C. half and half and blend for a few seconds to incorporate. You should end up with a smooth, creamy sauce (you’ll end up with a creamy sauce even without using the cream!) that tastes remarkable. Pour the sauce over pasta or use it in a wide variety of other dishes, as I’ve described above or as you invent! 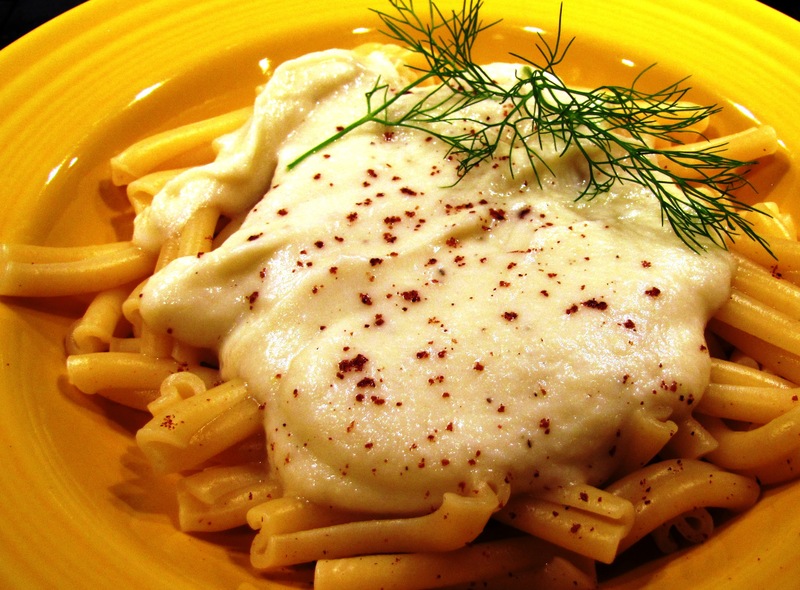 The image below shows it over the quirkly-named “priest strangler” pasta with a bit of fennel frond and a dash of sumac, both of which play nicely with the rich smooth, garlicky flavor of the sauce.